After restoration of a large concrete structure, the thickness of mortar layers used to repair erupted concrete areas had to be determined for quality assurance. The mortar system consists of two layers having a total thickness between 2 and 10 cm. Partially, the concrete structure contains reinforcing bars with a mesh width of about 15 cm. For selecting the optimum assessment methodology, a pilot study was performed and test specimens were designed and constructed with different mortar repair systems with varying thickness between 10 and 100 mm. These test specimen were investigated with radar, ultrasonic impulse-echo with one transducer and ultrasonic impulse-echo using an array with ten transducers. In this paper, the results obtained from the test specimen and from on-site measurements are discussed. The reliability as well as the accuracy of the different measurement techniques are compared. Before a significant damage progress is noticed at the surface of a structural element, damages can already be assessed or be localized prematurely by these techniques reducing the required costs for intervention at an early stage. The required amount of intervention and repair can be evaluated enabling an efficient planning of reconstruction. After reconstruction, the NDT methods can be applied for quality assurance. An application related to the last stage will be presented in this paper: After reconstruction of a large concrete structure, the thickness of mortar layers used to repair erupted concrete areas had to be determined for quality assurance. This is required especially for the reconstruction of large concrete structures to ensure a long time durability and leakage (e. g. for hydraulic engineering structures). The mortar system consists of two layers having a total thickness between 2 and 10 cm. For this testing problem, two complementary NDT methods have been selected: radar and ultrasonics. Both methods are impulse-echo techniques being applicable to constructions which are accessible from one side only. These methods had already been applied successfully to the evaluation of concrete structures [Ref 2, Ref 3, Ref 4]. Radar is based on the propagation of very short electromagnetic impulses being reflected at interfaces where the dielectric properties are changing. Therefore, it is very sensitive to the detection of metallic rebars. The reflectivity of the ultrasonic impulses depends on the difference of the acoustic impedances at the interface between two materials. Thus, ultrasonic waves are totally reflected at air voids and gaps. In this application, two modifications of ultrasonics have been used: one transducer working as transmitter and receiver and a transducer array consisting of ten transducers. A pilot study was performed and test specimens were designed and constructed to choose the most appropriate of the three methods. These test specimens consisted of two reinforced concrete blocks where the four sides of each block were covered with different mortar systems for coating and reprofiling. The thickness of the mortar was varied between 10 and 100 mm. Partial areas with different sizes were stemmed simulating concrete eruption. In this presentation, the results of the pilot study on test specimens as well as recorded on-site are presented. The advantages and limitations of each method will be described as well as the final methodology which was used to evaluate large areas. Radar (or ground penetrating radar (GPR)) as applied in civil engineering is based on the principle of georadar. This technology is already established for more than half a century and successfully used in geophysics for soil investigation [Ref 5]. By the development of high frequency antennas as well as of efficient computer systems it is now possible to examine small structures with enhanced resolution. The investigation of thin mortar layers up to a thickness of 10 cm was performed with the 1.5 GHz antenna. For suppressing or enhancing the reflection from the rebars, the polarisation of the radiated electromagnetic field must be considered. The plane of polarisation of an electromagnetic wave is defined by the direction in which the electric field vector is aligned during the passage of the wave. Usually, the polarisation of an antenna remains relatively constant throughout the main lobe. For the antennas used here, the polarisation is mostly linear, which means that the electric field vector at all times lies along a fixed line. If the electric field vector is parallel to a metallic bar, the cross section and thus the intensity of the reflection is much higher than if the electric field is perpendicular to the bar. Performing radar measurements in different polarisations is very efficient for deciding weather reflections occurred from rebars or from interfaces between mortar and mortar or mortar and concrete. The ultrasonic echo principle is similar to radar. The ultrasonic impulses are reflected at interfaces where the acoustic impedance (depending on mechanical properties) is changing. The distance from the inhomogeneities to the transceiver can be calculated from the run time of the acoustic impulses if the velocity of propagation is known. In contradiction to radar, for the interpretation of acoustic reflected waves it must be considered that at each reflection center mode conversion generating longitudinal as well as transversal waves takes part [Ref 6]. For the investigations with a single transducer, a commercial equipment was used with a frequency of about 1 MHz (Krautkrämer USM 25) which corresponds to a wavelength in concrete of 4 mm (assuming that the velocity of propagation in concrete is 4000 m/s). Here, the reflected intensity is displayed as function of depth (A-scan), which results from the known velocity of propagation. The intensity of the maximum from a selected window of depth is given on the display as number (in dB). During the last years, it was also possible to investigate concrete structures at larger depth up to 2 m. This is mainly due to the development of new types of broadband transducers operating in the lower frequency range between 50 and 250kHz and to the application of the principle of the synthetic aperture [Ref 7, Ref 8]. 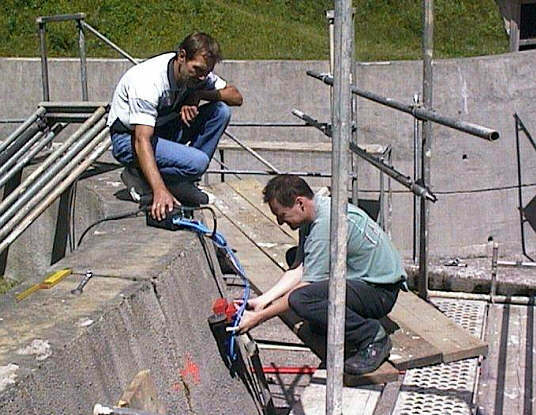 For this, ultrasonic measurements are carried out at many points of the surface and are evaluated by means of reconstruction calculations, which show the location and distribution of acoustic reflectors and scatterers in the volume of the tested concrete element. For fast data acquisition, an array of ten transducers was used. These transducers are positioned by a template and can be mounted to horizontal as well as to vertical surfaces. They are connected by a 25 m long cable to a multiplexer. With this set-up it is realized that each transducer can be used as transmitter while the others are operated as receivers, one after the other. For each position of the template, this results in 90 A-scans. Here, transducer arrays with frequencies of 85 kHz and 150kHz have been used which correspond to a wavelength in concrete of 47 mm and 26 mm, respectively (assuming again that the velocity of propagation in concrete is 4000m/s). For selecting the optimum assessment methodology, a pilot study was performed and test specimens were designed and constructed. These test specimens consisted of two reinforced concrete blocks (1300 mm x 1300 mm x 1500 mm). The upright four sides of each block were covered with different mortar systems for coating and reprofiling. The thickness of the mortar was varied between 10 and 100 mm. Fig 1: Schematic presentation of the mortar layers on side 4 of test specimen 1. In the following, only selected examples recorded at side 4 of test specimen 1 are presented. A schematic presentation of this surface is shown in figure 1. In figure 2, the equipment during application at the test specimen is displayed for all three methods. Fig 2: Left: Application of the two ultrasonic methods at one of the test specimen. Right: The radar antenna is shown on the left surface. From the test specimens as well as from cubes made of the used mortars cores have been extracted which have been used to determine the acoustic velocity of propagation in advance. Since concrete and mortar in this case have similar acoustical properties (e. g. absorption, scattering), the maximum velocity of propagation was selected for calibration recording to the guidelines US1 [Ref 9]. This velocity of propagation was 4173 m/s. Fig 3: A-scan of a measurement point located at the bottom part of side 4 of test specimen 1. The reflection from the interface mortar/concrete can be seen at a depth of 96 mm. From this diagram, it can be concluded that the thickness of mortar is equal to 96mm, which is close to the planned thickness of 100 mm as seen in figure 1. From the investigation of all surfaces of the test specimens it can be deduced that the single transducer equipment can be applied in most cases for the determination of the thickness of the mortar layers. Only in few cases, no results have been obtained. Some of the successful measurements giving the right thickness show a reflection with a very low intensity which does not fulfil a given intensity criterion. The results of ultrasonic array measurements from three areas on side 4 of test specimen 1 with a frequency of 85 kHz are presented in figure 4. Fig 4: Results of ultrasonic array measurements at side 4 of test specimen 1. Here, the reflected intensity from the investigated volume below the array as a superposition of the 90 A-scans is displayed as a function of depth. From the maxima of this depth distribution, the depth of the reflected layer can be determined. If this reflection corresponds to an interface, the backside of the element or an other object can not be recorded from this diagram and has to be decided from case to case. Here, a maximum appears at 75mm at area 1 (top left) and area 2 (top right) and at 80 mm at area 3 (bottom). These results are close to the planned value of 70 mm at area 1 and 2 and deviate of about 20 mm to the planned thickness at area 3 of 100mm, respectively. But not in all investigated areas in the other surfaces, such clear reflections appear. Therefore, it was not possible to determine the thickness of the mortar layers for all surfaces. All sides of the two test specimens have been investigated by radar using the 1.5 GHz antenna and recording parallel traces in different heights having a length of about 1m. Such a measurement is shown on the left side of a test specimen in figure 2 right. From the cores of the test specimen (as described above) it was not possible to determine the velocity of propagation for the electromagnetic impulses (the cores have been to small). Thus, a dielectric number of 7 was assumed and thus a velocity of propagation of about 0.11x109 m/s, which is typical for concrete. Fig 5: Radargrams recorded along a trace in the middle of the upper half of side 4 of test specimen 1 with a 1.5 GHz antenna. Left: Polarisation was parallel to the crossing rebars R1. Right: Polarisation was perpendicular to the crossing rebars R1. R2: rebar parallel to the trace. Figure 5 shows two radargrams recorded along a trace in the middle of the upper part of side 4 of test specimen 1 (as shown in figure 1). The two radargrams have been recorded in two polarisation configurations. In the left radargram, where the polarisation was parallel to the crossing rebars, the reflections from these rebars (R1) can be seen very clear as four hyperbolas in a depth of 10 cm and more. In the right radargram, the polarisation was moved by 90o being now perpendicular to the crossing rebars, thus these reflection can only hardly been seen, more or less they have disappeared. But now, a clear reflection band can be observed at a smaller depth than the hyperbolas in the left radargram. This reflection can be either explained by the reflection at the interface mortar/concrete or by a reflection at a rebar being parallel to the trace (must not be directly below the trace). Since this reflection is very week in the other polarisation in the left radargram, the second explanation is more suitable. Nevertheless, a superposition of both reflections can not be excluded. Therefore, with radar only the mortar/concrete thickness above the reinforcement can be determined, which is also useful, since in most cases this thickness is equal to the thickness of mortar for repair. This assumption was approved by most of the cores taken from the test specimen and from the concrete structure as well. From the sketch of this surface of the test specimen in figure 1, a thicker mortar layer is expected in the right side, because 70 mm of mortar were additionally covered by 2x2 mm of filling. In the radargrams in figure 5, on the right side this layer appears more or less thinner than on the right side. This might be due to different velocities of propagation. An additional reflection at the interfaces to these additional layers can not be oberserved in the radargrams and is also not expected since these might be superimposed by the surface reflection and can not be resolved by the impulses emitted from the 1.5 GHz antenna (this frequency corresponds to a wavelength in concrete of about 7 cm). Fig 6: Radar investigations with the 1.5 GHz antenna along a concrete wall. Since radar requires no coupling agent and thus enables fast measurements over large areas, this technology was selected for on-site measurements. In the retainable areas of the two carrying walls of the concrete structure, radar traces were recorded with different lengths at various heights (see figure 6). Before the start of the measurements, the position of the rebars was determined with a cover meter (mesh size: 15cmx15cm). Thus, the horizontal radar traces could be positioned between the horizontal rebars reducing the unwanted reflections induced by these rebars. The first traces have been recorded in both polarisation configurations of the antenna. These traces showed that the horizontal polarisation for the horizontal traces gives the best results (reduction of the reflection of the crossed rebars, as described above). Thus, all following traces were taken only in this configuration. Distributed along the area to be investigated, 36 cores had been extracted before the start of the measurements close to the traces for calibrating the velocity of propagation. This resulted in a velocity of propagation of about 0.12m/ns which corresponds to a dielectric constant of 6 (typical value for dry concrete). Figure 7 displays a selected radargram of a horizontal trace from a lower region of one of the carrying walls. As described above, the reflections from the crossed rebars is very weak. The interface between mortar and concrete (or mortar and rebars) can be seen by a very clear reflection at depths varying from 5 to 8.5 cm. This reflection is enhanced in the radargram by a white line. Due to calibration, the calculated depth has an accuracy of ±1cm. The position of the core taken close to this trace is marked by an arrow and had a thickness of 7.6 cm. From all measured traces and by calibration with several cores, the thickness of the repair mortar varied between 3 and 10 cm. Thus, this mortar layer was too thin in most of the investigated areas of the carrying walls. Fig 7: Radargram recorded at the carrying wall with the 1.5 GHz antenna. The polarisation was horizontal, i.e. parallel to the antenna movement. For the investigation of layer thickness of different repair mortar systems sprayed and filled on the surface of reinforced concrete structures, two complementary NDT methods have been selected: radar and ultrasonics. Both methods are impulse-echo techniques being applicable to constructions which are accessible from one side only. For testing and selecting the optimum methodology for on-site measurements, a pilot study was initiated based on the design, construction and investigation of test specimen. From the investigation of all surfaces of these test specimens it can be deduced that the single transducer equipment (single probe technique) can be applied in most cases for the determination of the thickness of the mortar layer with the best accuracy (due to the smallest wavelength of the ultrasonic waves of about 4mm in concrete). Only in few cases, results have been unreliable. With the ultrasonic array system which works at much lower frequencies, clear reflections appear only in few cases. And due to the high wavelength, also the accuracy was less than with the single transducer. With radar, in most cases only the mortar/concrete thickness above the reinforcement can be determined, which is also useful, since in most cases this thickness is equal to the thickness of mortar for repair. This assumption was approved by most of the cores taken from the test specimen and from the dam as well. Since radar requires no coupling agent and thus enables fast measurements along large areas, this technology was selected for on-site measurements. From all measured traces and by calibration with several cores, the thickness of the repair mortar could be determined and as a result it varied between 3 and 10 cm. The accuracy of the thickness determined at one position is about ±1.5cm. Thus, this mortar layer was too thin in most of the investigated areas of the carrying walls. The measurements at the test specimen have been performed with the help of Dipl.-Ing. B. Maier (BAM VII.1). The on-site investigations have been assisted by Dipl.-Ing. I. Krause (BAM IV.4). We kindly acknowledge the help of IGB (Ingenieurgesellschaft Bauwerke, Karlsruhe) for organisation and planning of the measurements. Krause, M., Wiggenhauser, H. and Krieger, J., ''Materialtechnische Untersuchung beim Abbruch der Talbrücke Haiger'', in: Bundesanstalt für Straßenwesen (BASt) (Hrsg. ); Berichte Reihe B, Brücken- und Ingenieurbau, Heft B18, Bremerhaven: Wirtschaftsverlag NW, Verlag für neue Wissenschaft GmbH, 111 pp.